The vegan and vegetarian markets offer a lot of products trying to match traditional meat products. Consumers are looking for convenient products that can help them keep their diet plant based, so they don’t have to sacrifice on the products they like eating. The consumer of today is more critical than before. A product that does not meet expectations will easily be dismissed. The food manufacturers therefore must focus on the eating pleasure and texture to get as close as possible to the traditional non-vegan product. As KaTech has a wide range of experience in the different food areas, we have developed products that can achieve the same eating sensation like the traditional products but are based on plant ingredients. 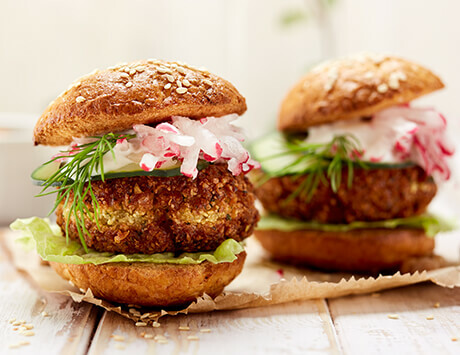 Our recipes range from vegan burger patties to cold cuts, paté or aspic, a traditionally gelatine based product which is popular in various European countries. The challenge of developing vegan burger patties is to achieve the right texture and bite sensation. At KaTech we have developed the right textures with our functional ingredients. Vegetables in aspic are popular in several European countries. The gelatine can be replaced by a plant based jellifying agent. You will have the same eating and storage properties as traditional products. Cold cuts are often eaten in sandwiches. At KaTech we have developed several recipes of vegan cold cuts. The biggest challenge in vegan meat alternatives is to achieve a texture that is matching the traditional meat product and is fulfilling the requirements of the consumer. Talk to us today to find the best solution for your processing requirements. At KaTech we have a lot of experiences in cost optimising recipes. We can often help by changing ingredients or looking at the process and ways to reduce waste during production. Just get in touch with us, to find out more.